September 2014 – RallyNews – Patterson Pacenotes Extra's…..
Enniskillen Motor Club are once again running their Clubmans Stages Rally on Saturday the 4th of October. The rally has switched formats over the year’s but recently it has run exclusively as a gravel event. This year the route has been expanded to a loop of three stages done twice and we can report that the stages are in great shape. With gravel rallies becoming less frequent, it is fantastic that Enniskillen MC have the enthusiasm to run another event just four weeks after their main NI championship event. 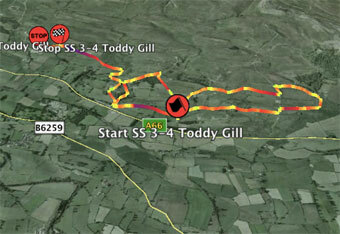 The rally is restricted to two wheel drive and is based out of the Old Pals Bar in Derrygonnelly, Co Fermanagh. Below is a short sample video of some of the stages. The Patterson Pacenotes and DVD will be ready for despatch from Monday 28th September and can be ordered online at this link or by telephone during normal business hours: 028 90 844111. Today sees two of the season’s most popular events taking place. The Trackrod rally in Yorkshire, a BTRDA and RAC championship rally and also the Bushwhacker Rally in Co Tyrone, a round of both the NI Rally Championship and the Irish Forestry Championship. 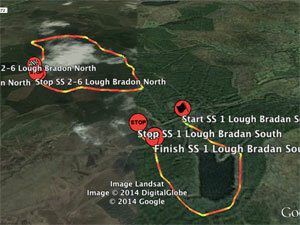 Here are our own Google Earth speed traces of this year’s rally. 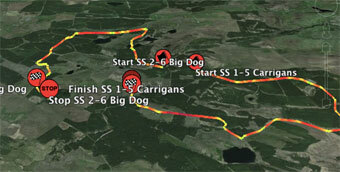 Good luck to everyone involved and have a safe rally. Enjoy. has now moved up the road 200 yds to the next lay-by. A PDF with a copy of each note system and the highlighted chicane is available below. Its been a few weeks since we posted any of our Jemba Speed based Google Earth Traces. 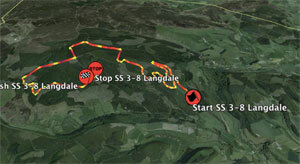 Well, this weekend we have plenty going on and that includes both the Pendragon and Lakeland Stages. Below are links to the GE Files for both events. Good luck to all competitors on what is a very busy rally weekend with lots of events going on all over the British Isles. Have safe and enjoyable rallying weekend. Lakeland Stages Google Earth Files View.